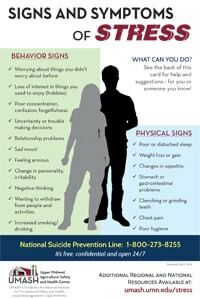 Know how to recognize the signs and symptoms of stress and what you can do for yourself and others. This NEW resource was created as a result of a partnership with UMASH and the Minnesota Department of Agriculture (MDA) to address the emerging issue of stress and mental health challenges facing farmers, agricultural workers, and their families. The card lists some of the behavioral and physical signs of stress, as well as tips and resources for what to do if you or someone you know is experiencing stress or mental health challenges.